Lou Davis, daughter of Micajah Davis, one of the earliest settlers of Grayson County. After the loss of the late war he removed to Whitesboro and engaged in the mercantile business with Capt. Sam B. Savage. He died October 16th, 1886. His last wife survives him. 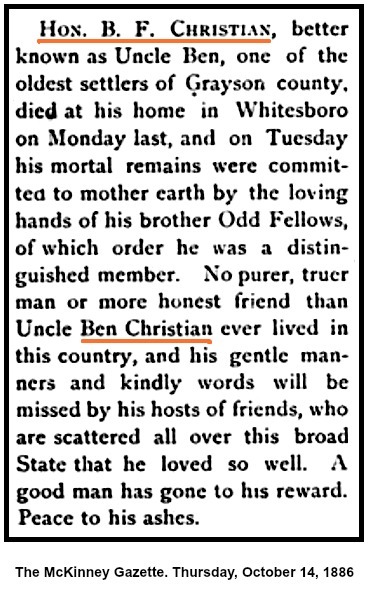 "Uncle Ben," as he was familiarly called, was a devoted Odd Fellow. 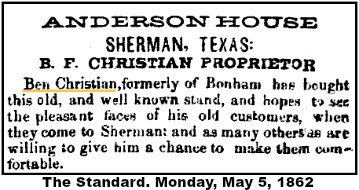 It may be justly said of him that he was the father of Odd Fellowship in North Texas. For years he traveled from the Sabine to the extreme western frontier, even when the Indians deprecated the western counties, organizing Lodges and lecturing. 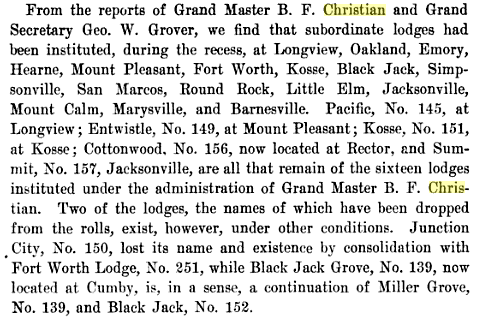 Under dispensation of the Grand Master of the Sovereign Grand Lodge, he instituted the first Lodge in the Indian Territory, at Caddo. He was a charter member and organized the Lodge at Whitesboro, which was named for him, in the year 1868. 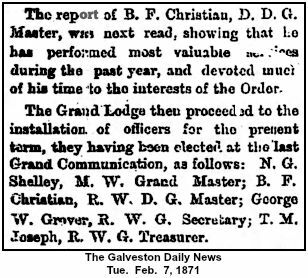 In 1872 he was elected Grand Master of the Grand Lodge of Texas. 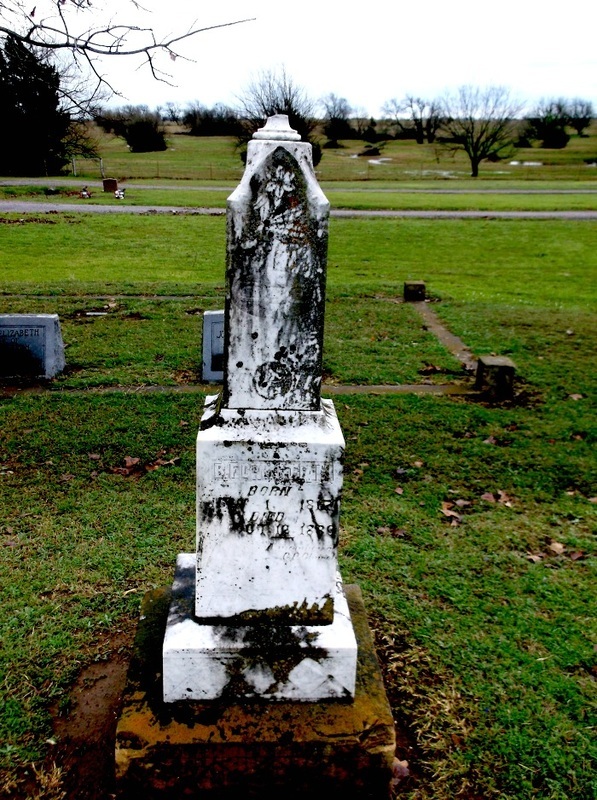 He was a consistent member of the Cumberland Presbyterian church, and one of the most active workers in the Old Settlers' Association, having delivered a most touching valedictory at the reunion in Sherman in August 1886, about two months before his death. 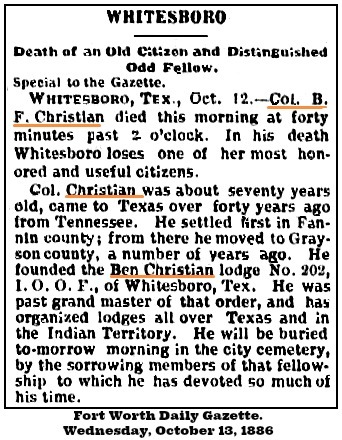 He was buried at Oak Wood Cemetery in Whitesboro, Texas. 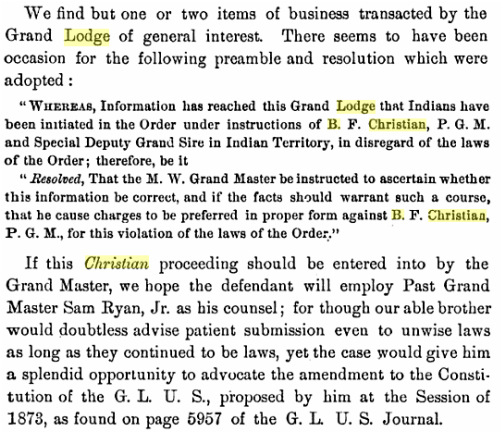 The post above, came from an old 1874 Grand Lodge proceedings booklet. Evidently there were still some I.O.O.F. members that still had animosity toward American Indians and wanted some old laws to be enacted. Or maybe they just wanted to test the G. L. U. S. laws. Caddo Lodge No. 1 was instituted just the same. We read nothing else of the charges brought against B. F. Christian. It is assumed that the charges were dropped. 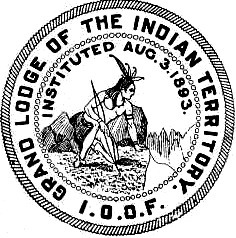 With Oklahoma statehood in November 1907, the Indian Territory Grand Lodge was extinguished. ODD FELLOWS CEREMONIAL GAVEL, PRESENTED TO B. F. CHRISTIAN LODGE #102 IN 1888. 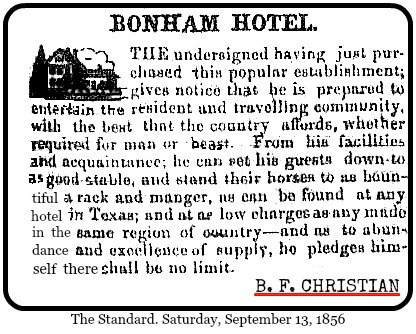 1872 Texas Historical Event - Construction of Railway began.